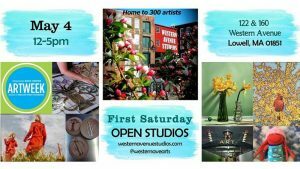 Home » Events » Western Avenue Studios – Open Studios! Western Avenue Studios – Open Studios! Artists of Western Avenue Studios are hosting a day of food, drink, and art! With as many as 100 open studios, 5-10 lofts, food trucks, and brewing companies, the Open Studios offer something for everyone! Meet the artists, see new art, shop for unique gifts, and stop by to enjoy some good company. The Loading Dock Gallery will also be hosting their new show after the Open Studios end.